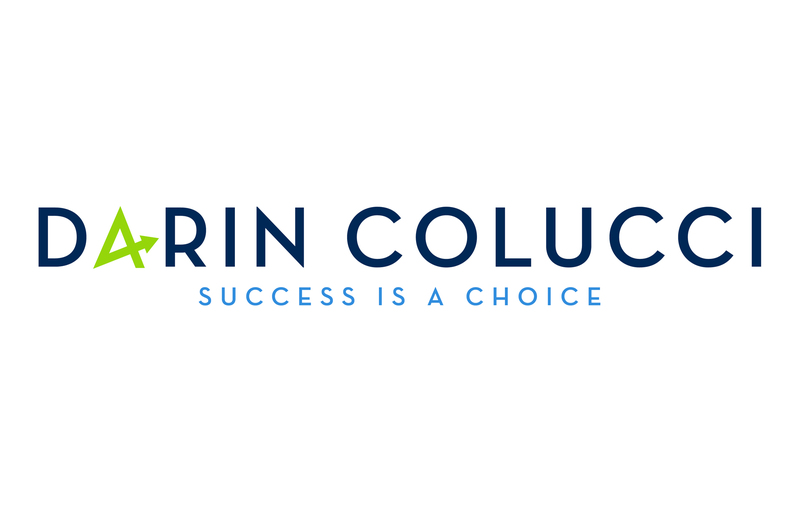 Successful trial attorney, author, and motivational speaker Darin Colucci seems to have it all—a top-notch career, a happy family, and a warm personality to match. He is one of the founding partners of Colucci, Colucci, Marcus & Flavin, has been a commentator on WBZ Radio in Boston, and, along with his firm, has been recognized numerous times by the publication Super Lawyers. Newsweek even named him one of the best personal injury attorneys in America. Success and happiness are two key words associated with Colucci’s work and personal life. What else could one ask for? 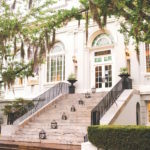 With more to give, Colucci has also written several works of fiction, become a successful real estate investor, an entrepreneur, and even an inventor who recently designed a safety mechanism to stop wandering in daycare centers and Alzheimer units. In short, it seems like he could give the phrase “been there, done that” a run for its money. Additionally, Colucci spent twelve years as a high school and college football coach, during which time he gave dozens of speeches on subjects such as success, integrity, mindset, and the importance of attitude. This point in his career prepared him for what he believes to be his true calling: motivating others to find happiness and success. 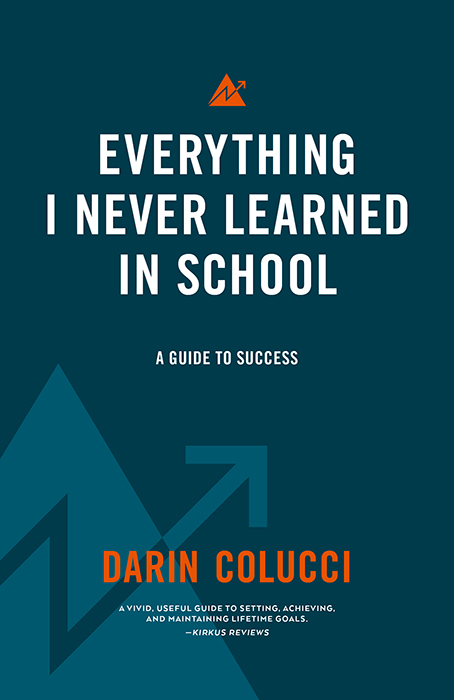 Now Colucci uses his passion to help others, spreading tangible advice on the secrets to success and happiness in his book, Everything I Never Learned in School: A Guide to Success, and through speaking engagements, blogs, and his YouTube video channel. We’re honored to be part of the journey. 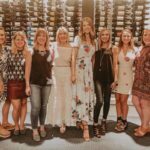 In early 2017, Darin Colucci approached The Idea Boutique with the opportunity to build his brand and market his passion, and we were thrilled to be on board. 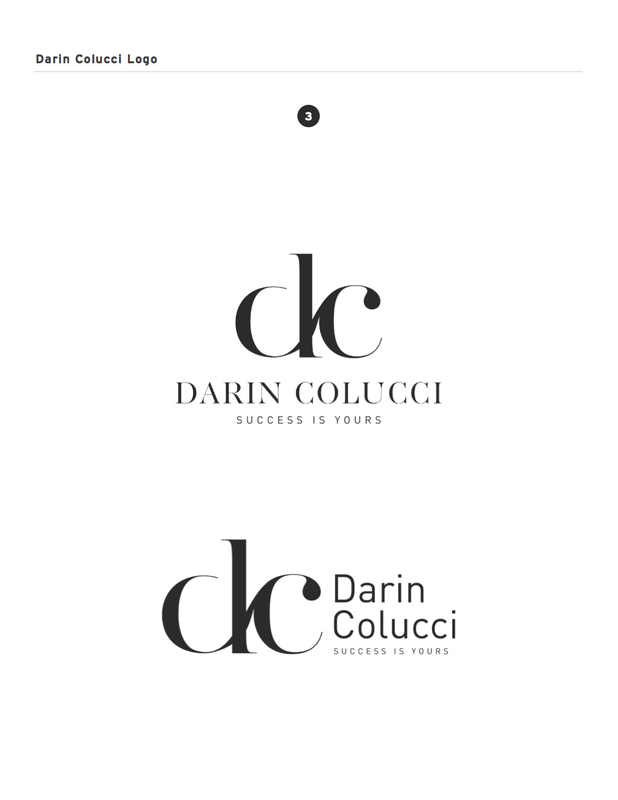 After reviewing and thoroughly analyzing his existing website and the first edition of his book as a branding agency and consumer, we had a clear sense of direction on how to align his market the Darin Colucci brand to reflect his integrity and aspirations, and how to connect with his audience. We needed to start from scratch building his identity and answering the four core questions: who, what, why, and how. Who is Darin Colucci? What does he stand for? Why is his product important? How can it connect with the general public? There were a lot of ideas and questions flowing during a series of brainstorming sessions among The Idea Boutique team. A key factor to remember when branding our client’s business was that it needed to be the perfect blend of his desired vision and our expertise. We determined that Colucci needed a new branded look, new website dedicated to his writing and motivational speaking career, and a new design for Everything I Never Learned in School. After getting Colucci’s thoughts and narrowing down our ideas from all team members here at The Idea Boutique, our senior graphic designer and brand manager, Corinne Garlanger, started to develop some logo designs while our assistant art director, Lucy Young, spearheaded the new book design. There were a number of logo and book cover options. 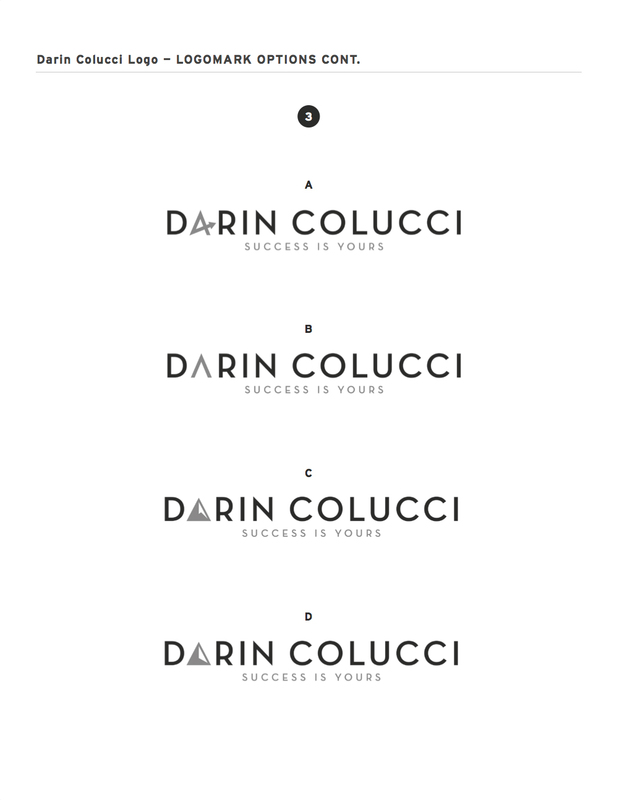 We also wanted to employ a tagline to go along with the “Darin Colucci” logo that would give audiences a little more insight into his brand. “Success is a Choice” was a concept found throughout Colucci’s book and in his real-world advice, and it made the perfect addition. The same concept was applied to the new book design. “Darin seemed to really respond to the book covers that indicated graph-like images,” Lucy adds. Most of us know that we’re not supposed to judge a book by its cover; however, we are all guilty of doing so. If the appearance doesn’t seem to have had any thought put into it, why would the content? Or maybe the cover is telling a different story than what’s actually written. As the publisher of the second rendition of Colucci’s book, we agreed that the book cover is just as vital as its content when you’re trying to reach potential readers. The original cover featured an image of sneakers on a hopscotch path. The book title makes its content clear, but judging by its cover, one would probably assume the book was full of advice for adolescents and young adults making their way into the “real world.” While Everything I Never Learned in School is perfect for those just starting out, Colucci also wanted to convey that the concepts in his book are tangible to anyone who wants to achieve success, regardless of his or her age, background, or career path. Added note space engages readers to interact with each chapter tasks. It was also important to alter the interior of the book. Our cofounder/vice president Gerald Burwell and communications director Jordan Staggs thoroughly proofread and edited each page, while Lucy created the new layout. 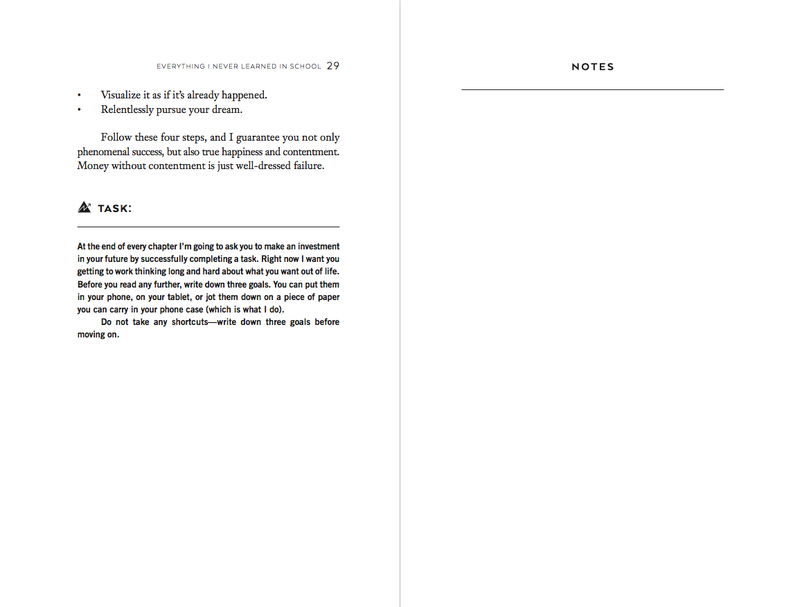 The book has a task list at the end of each chapter for readers to put its advice into motion, so it made sense to make the book as user-friendly for readers as possible by adding a blank Notes page after each of these sections. The arrow theme from the cover was also reflected throughout the interior. There were a few color schemes we loved for the website, but we felt it wasn’t necessary for the book to match it exactly. 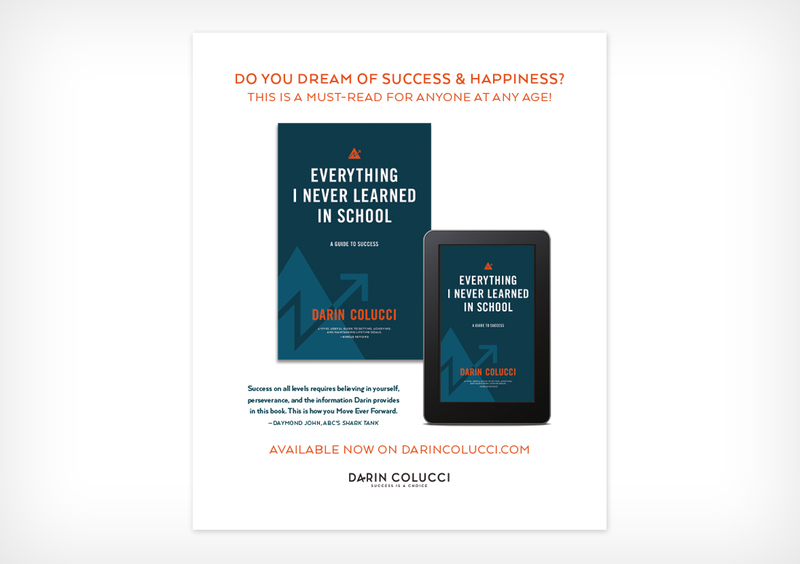 Since Everything I Never Learned in School isn’t the only product or service Darin Colucci has to offer, we focused on designing the book to match the feel of his brand but to be its own entity. Don’t underestimate the power of a visually appealing and easy-to-navigate website. It’s the online representation of your brand, so think about how you want to appeal to your audience. Do you want to seem professional? Are you hoping to have repeat and new visitors? Then taking the time to develop a proper website that’s compatible with all electronic devices is important. 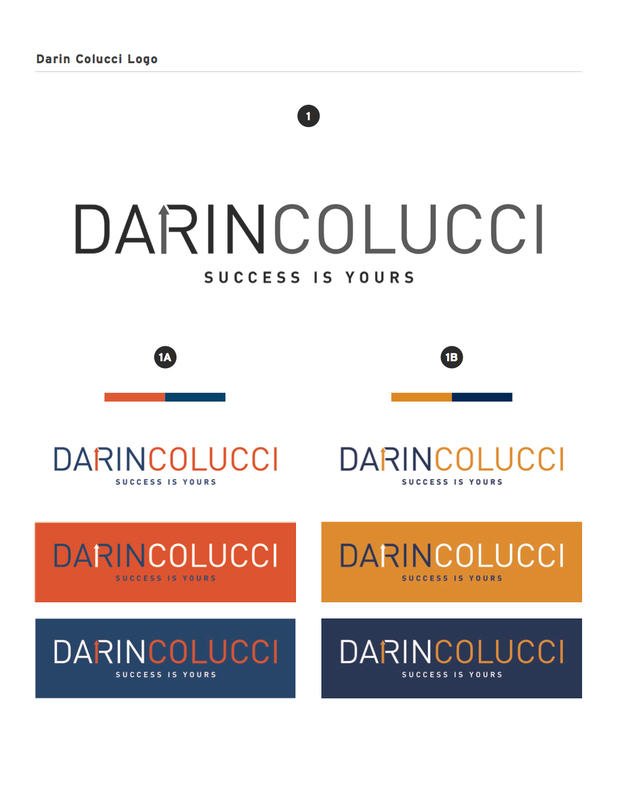 Our digital marketing director, Meghn Hill, developed a beautiful new website at DarinColucci.com that captured the spirit of Colucci’s brand and the look of his print collateral. She even reflected his arrow logo mark design in the site’s bullet points for that extra touch. The overall look of the website, newly designed book, business cards, and presentation templates is consistent and carries a clean, modern, and age/gender neutral presence to appeal to the masses. Although Colucci is a first-time author and his book has been in the spotlight, we did not want to limit his brand to just one book, so the website has a wider focus. This opens him up to publish multiple books and wear different hats as a speaker and author while still maintaining his brand. This website is where all the entities of his brand come together in one cohesive environment. 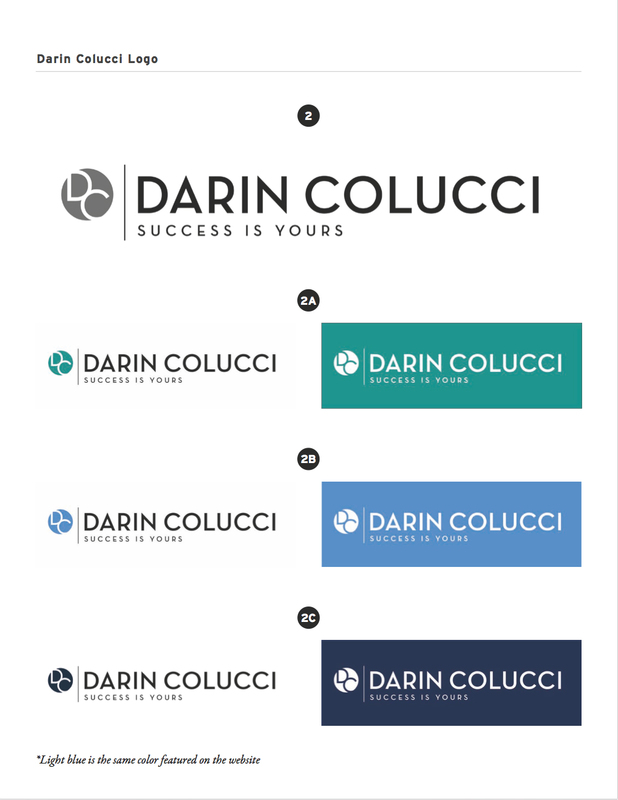 Social media pages were set up for Darin Colucci on Facebook and Instagram to reach his audience further and drive traffic to his website. 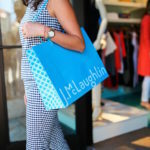 The Idea Boutique managed daily posting on these platforms sharing advice from Colucci’s book, branded graphics with motivational quotes, blog posts, videos, book news, speaking engagements, and more. Since Colucci’s new launch and redesign, and with a clear brand identity, it’s been a pleasure to see, feel, and celebrate the positive outcome. Projecting a clear sense of who he is, what he’s about, and why his brand matters expanded his opportunity widen his audience. His message isn’t only for those who have just graduated from high school or college. It’s for anyone who wants to be successful in any endeavor and anyone who wants to achieve happiness in life, from students to CEOs and everyone in between. Videos from his inspiring speaking sessions can be found on his YouTube page. Since the redesign, Everything I Never Learned in School has expanded its reach and is available for purchase through Amazon, Barnes & Noble, and Books-A-Million. You can even download it on your portable electronic devices, iPhone, iPad, Kindle, or Android phones and tablets. There’s also been an organic growth on reviews and sightings of the book. 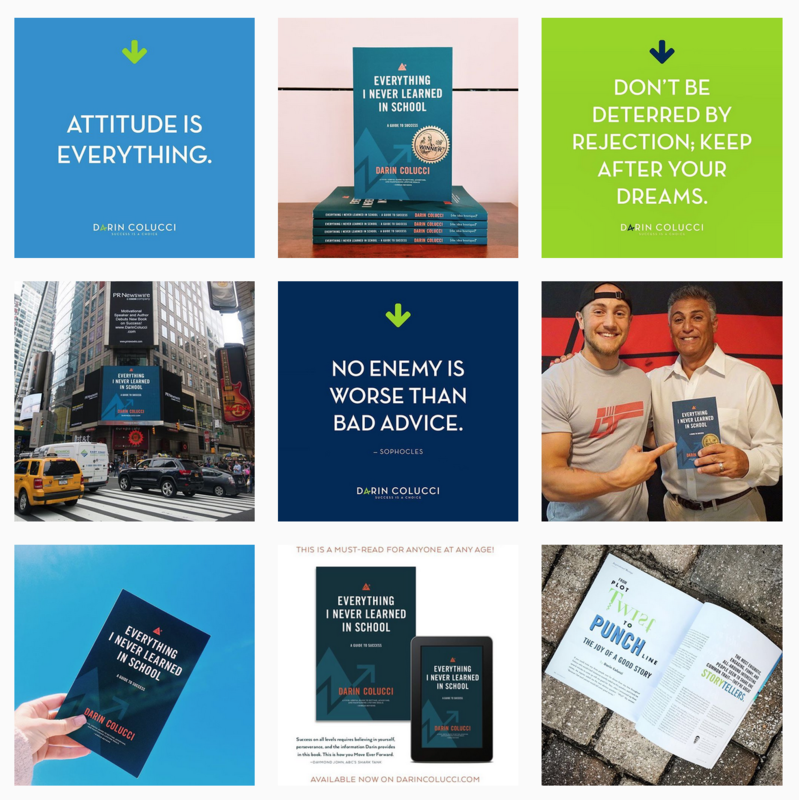 American businessman, investor, and Shark Tank star Daymond John not only issued a positive statement to use on the back cover of the new book design but has also recommended it on his social media pages. Additionally, it earned a 2017 Eric Hoffer Award in the Self Help category. This is only the beginning. There’s still more to come, and we cannot wait to share updates with you. Success is a choice!